Well, we all knew it was coming at some point. On Thursday, December 31st, I went into the Odyssey, a local tattoo/piercing parlor and had the kind and skilled staff implant an RFID tag into my hand. 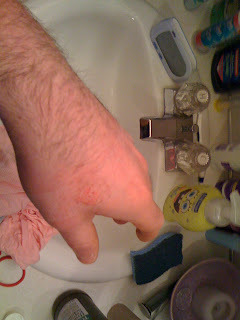 They used a 12 gauge piercing punch and put it into my hand with no anesthetic. I took the pain fairly well, only squeezed my eyes shut as the needle was inserted. It was all over in seconds. The problems started then. Instant adrenaline rush through my entire body made me dizzy and sweat came from just about every pour in my body. After a few minutes i was good to go again. 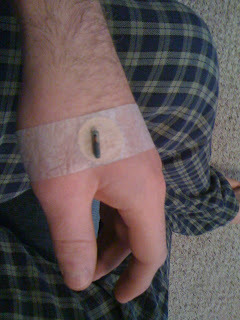 Here are the photos along with a video of the implant in action. Just a small update: after taking this vid, I did some more work on the Zuk. I've bypassed the clutch safety switch so that I do not have to push the clutch in to start the car. I now just need to remove my actual ignition switch and wire the leads up to toggles/rockers. hey does the tag show through like in the last picture? What kind of tag did you go for? I've been thinking about doing this, and I have some 4002 capsules but I'd kinda prefer something read/write. Id like to second Jason's comment, what type of tag did you use and where did you get it from? @Mr sayao: No the tag does not show through at all. 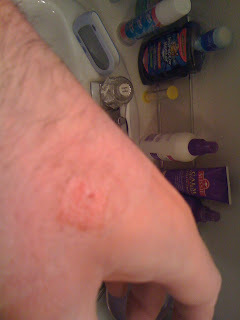 That pic is just to show where the tag was inside my hand. For read/write, you might want to look into the HITAG 2048 (google it). I need to find a way to get my ignition attached to that rocker switch now... I had it done before, but the wires got super hot... I think I need smaller gauge wires. I used a Trossen as well, the 13X3 has better range, and you need every mm you can get with an implant. Trossen has a disclaimer at the bottom of their page for the EM4102 ampoules saying that they're not for human or animal implantation as they're not sanitized. How did you convince a piercing shop to do this for you? How did they prepare the ampoule? Are they autoclaveable?